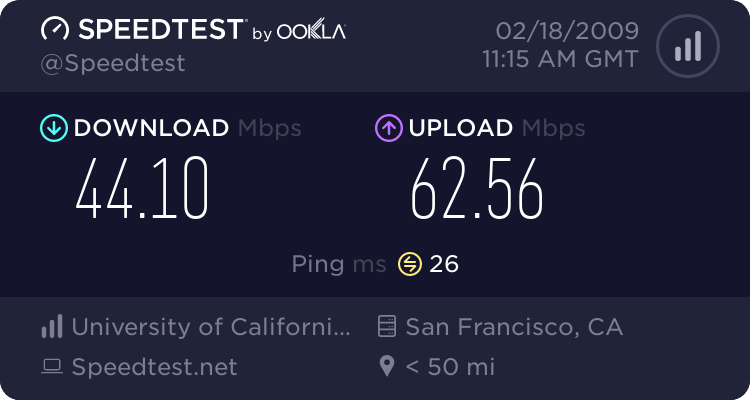 Post your Speed test results here. 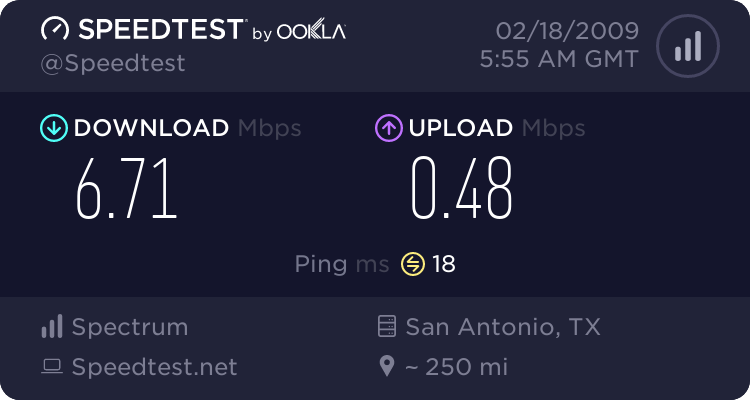 Re: Post your Speed test results here. and here's my iPhone's score on the same wireless network. Last edited by IwantMORE; 02-16-2009 at 06:34 PM. Proof that Aussies are getting ripped the hardest! Damn it! Not really. 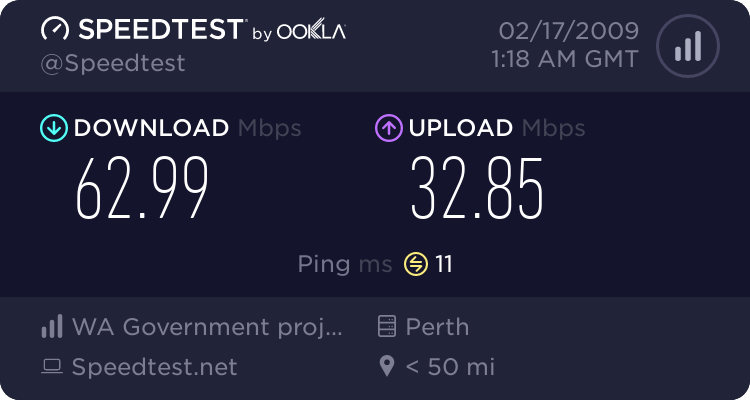 24mbit ADSL2+ connections are pretty cheap nowadays here and that's a better speed then most people have posted here. We are not getting ripped the hardest. Far from it. Last edited by ReadOnly; 02-17-2009 at 03:08 AM. Lower ping and distance from Düsseldorf (recommended server) than Amsterdam? I don't understand why my ping is so low on this tests. Pinging from command line for various sites gives me far better results. Hey if you dont mind tell us what you pay a month, in USD. In the end I probably pay the same or more when we look at the prices in terms of buying power. I am on a fixed 2MB connection but as I moved recently they moved me onto the new price which was nice. Dare I ask what your sync speed is? 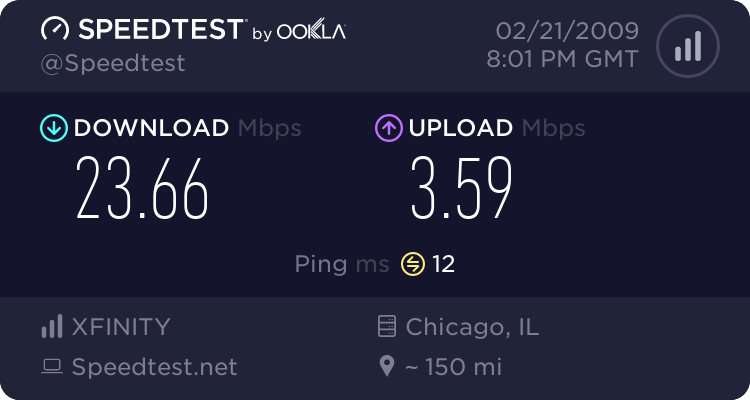 Depends, my speed when syncing what? 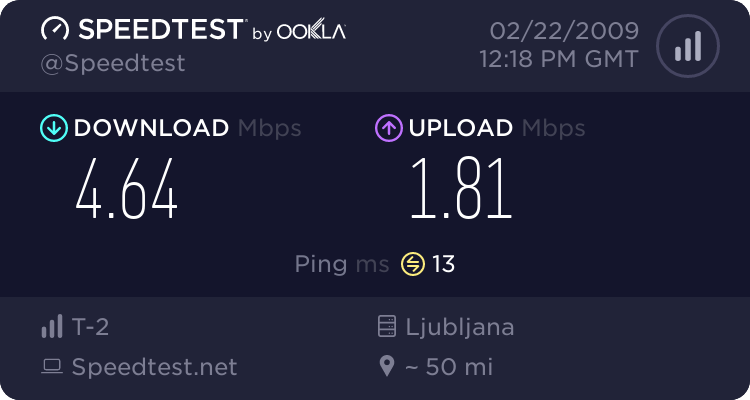 1,5Mbit for a 15 bucks. Not that bad... But then again, not that good either. 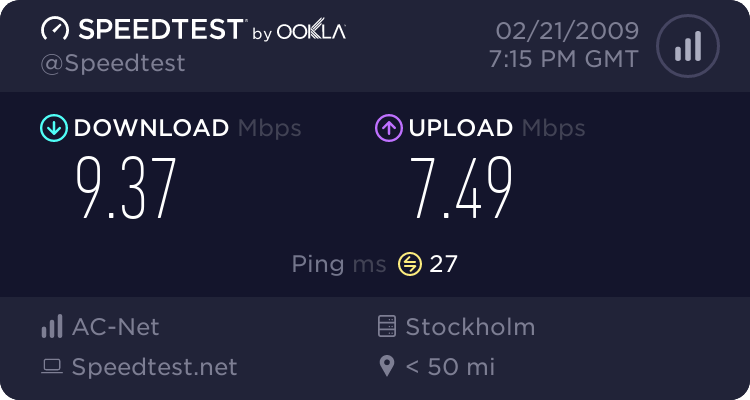 Well not too good, but I want to change the ISP soon. 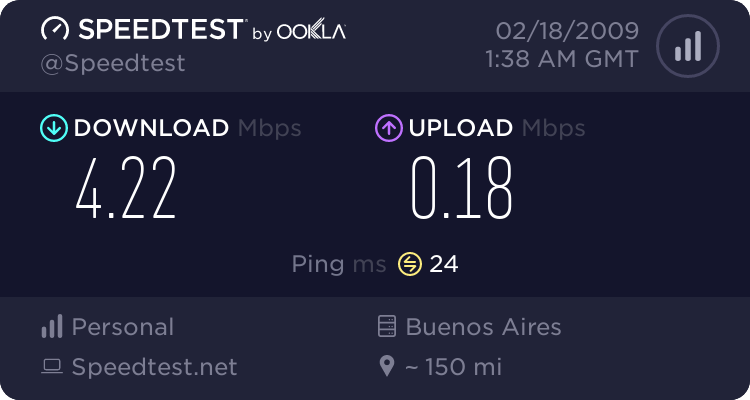 Aaaaand, if memory serves me right, i´ve got the fastest residential connection you could possibly get around here. 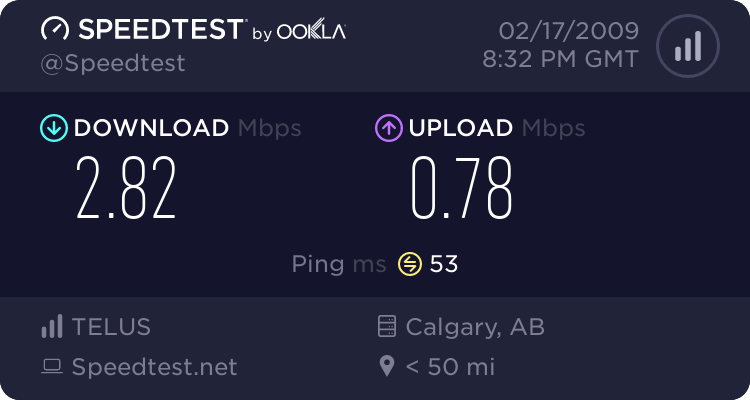 Goes to show we have crappiest connections around. 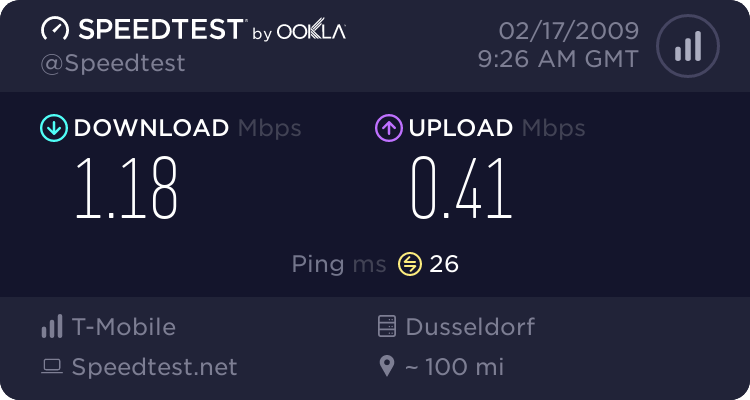 My connection should be 2Mbit/2Mbit but apparently the upload isn't even the same as the download, and all this crap for 33€. 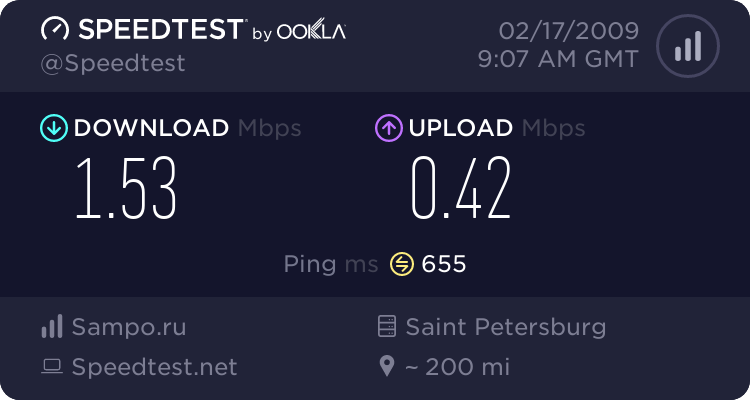 I think I'll end up paying more for just a steady connection. 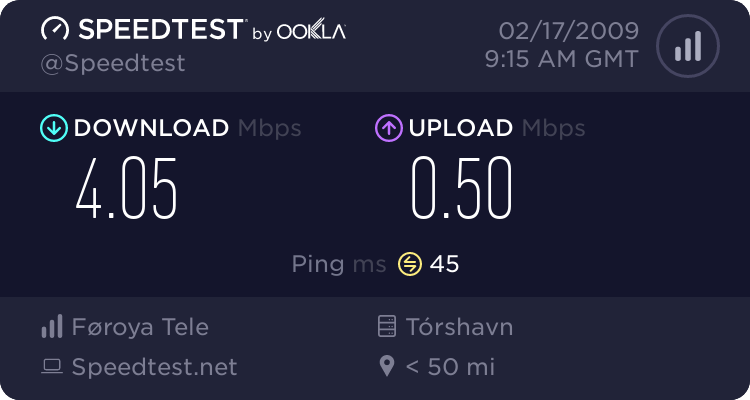 I mean come on, the ping is 600 within my own small country? Last edited by Daedolon; 02-17-2009 at 08:39 PM. Oh so you want to have a debate? Rambo music kicks in, gearing up sequence initiated, headband tied on..
yeah i guess your right, were not that bad off. I just want more for my buck! I'm living close to you. And the pings are the same. I think it's something to do with speedtest itself. 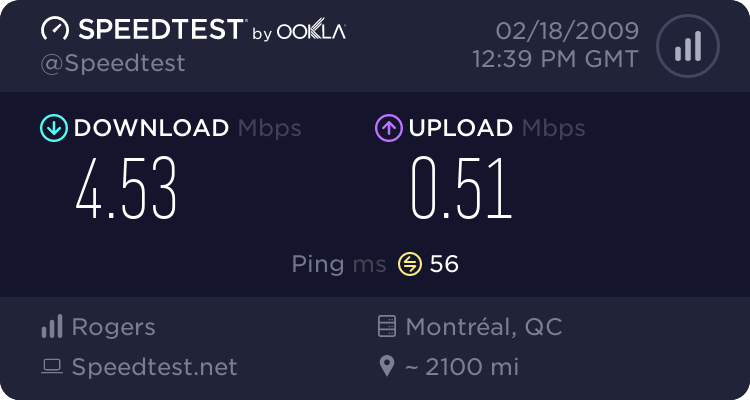 Because I tried pinging(through command line) various site outside of the continent and the ping was faster. So local's all well and good but I did some testing at work and was surprised to see the transatlantic connection is seriously crippled! I can't believe some of you have Roadrunner. You guys are going to be jealous. Hmm, I wonder what ISP my school uses? 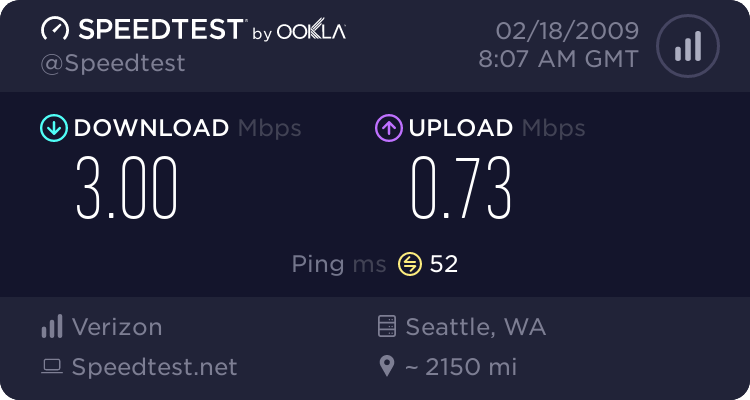 This is my ISPs mid-range service that I pay about $35 US for a month. "Those damn PigCops are gonna pay for spreading Swine Flu!" Find More Posts by Montykoro! TBZ still beats you on download. Enough for me at the moment. 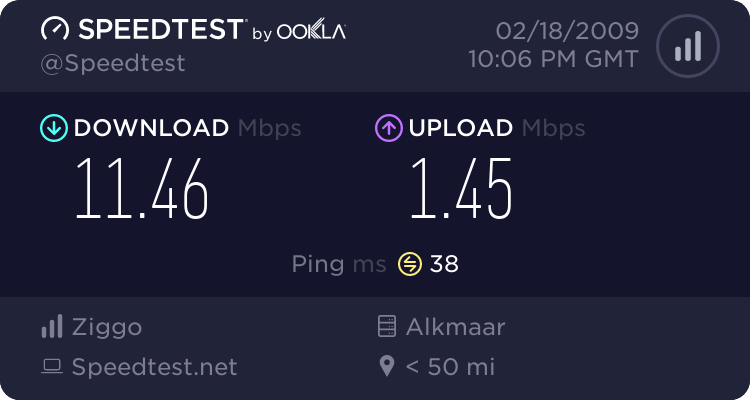 UPC's Fiber Power 60 (60/6Mbps) and 120 (120/10Mbps) are nice, but monthly fees of €60 and €80 are not. I think that's just DNA failing. 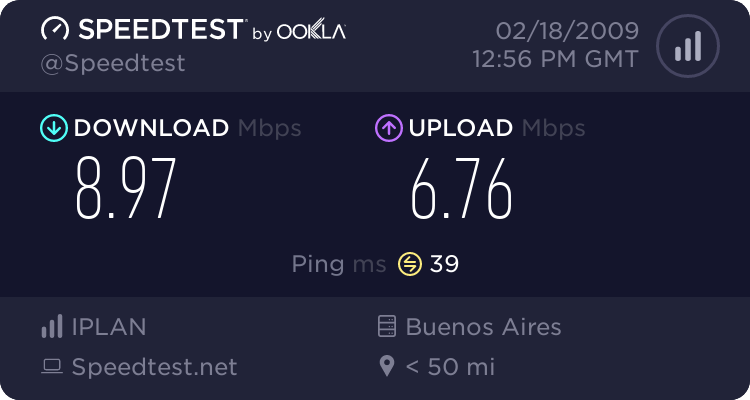 I have a 8mbit/s connection with Sonera, and the ping is never over 60 running the test. 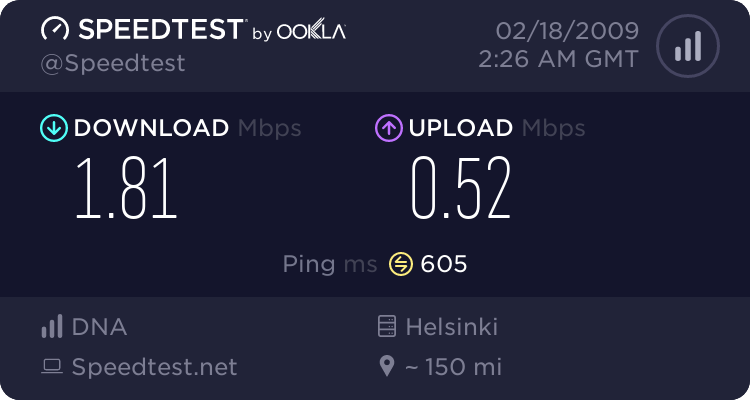 Helsinki server. since im living in one apartment with 2 other guys it boils down to 15$ with the hassle of realy wanting to kill one of them because he aswell fails to grasp the concept of the lowupload AND is resistant to any argument if he doesnt like it, especialy if i'm making it. cant speak for america, but here most universitys are connected via the DFN (german research network). 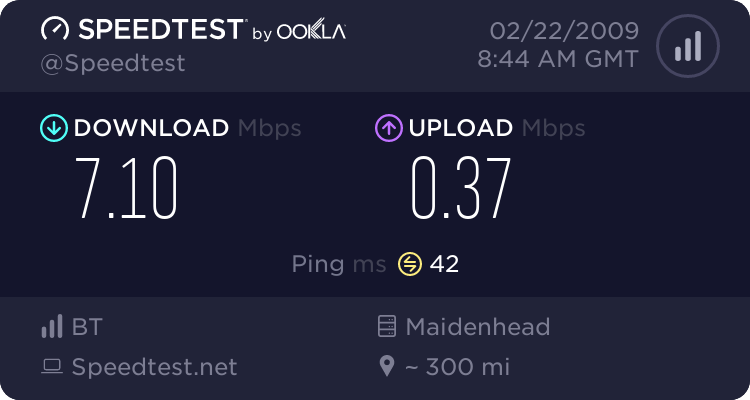 £25 per month (ish) but has free wifi access at BT Openzones included in the price. 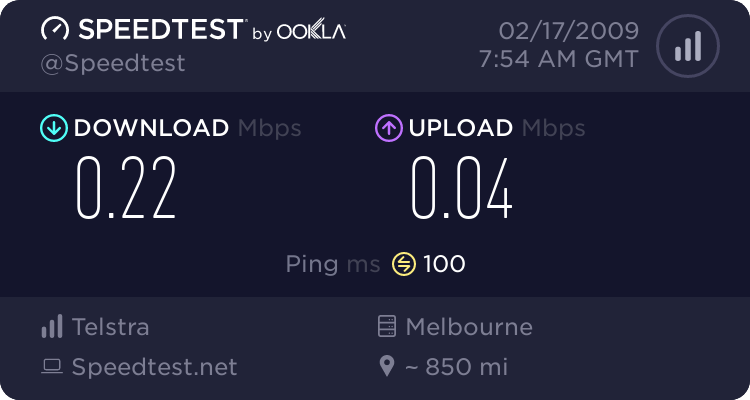 Advertised as up to 8mb, line is rated for 6 & I'm practically within sight of the exchange. Last edited by Chimera; 02-22-2009 at 02:45 AM. The price is split between net and service and to lazy to look up the actual price but it's around 30-40 $ total.